Lots of courgettes! Lots of fun! It’s summer (yes, an English summer, but summer non the less) and we are enjoying our neighbour’s glut of courgettes. Almost every day we get 5 or more beautiful fresh courgettes. And so, I find myself making everything (SCD bread, SCD muffins, salads, roasted veg) with courgettes. But sometimes I’m stuck for inspiration. The food channel is our guilty pleasure. We watch programmes about fatty, bready american diner food, beautiful baked cakes and dessert full of sugar and flour and many other foods we just don’t/won’t eat, but love to watch. One afternoon a recipe for courgette fritters caught my eye. It was, of course, made with breadcrumbs and feta cheese; and the fritters were deep fried, which is something I try not to do. 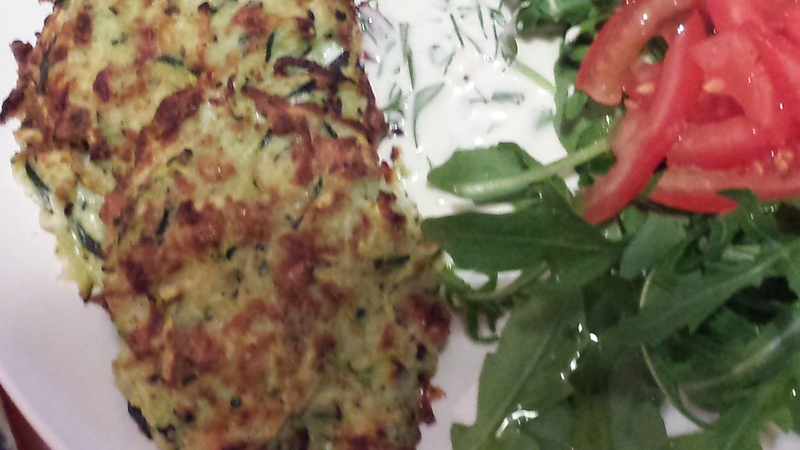 But, it inspired me to experiment with making my own fritters, made the SCD way and baked/grilled, rather than fried. Heat your oven to 200˚c. Line a large baking sheet with aluminium foil, then spread a thin layer of olive oil on it using a brush. Squeeze the water out of the grated courgette, using the palms of your hands or twisting in a tea towel. In a large bowl, combine the roasted squash, ground almonds, 1 egg and seasoning to a thick paste. If the mixture is too thick, add the second egg. Add the grated cheese and squeezed courgettes and mix well until all the ingredients are well combined. Using your hands, shape patties and place them on the baking sheet, then drizzle a few drops of olive oil on top of each patty. Bake in the oven for 10min, then switch your oven to ‘grill’, move the tray to the highest level in the oven and grill the top of the fritters so they colour nicely on top for about 3-5min. Remove from the oven and leave to cool for a few minutes before serving (this will make removing them from the tray easier). Chop 2tbsp each of Parsley and Dill (or any other herb combo you like) into a bowl, mix in 2tbs SCD yogurt, 2tbsp home made mayonnaise and salt and pepper to taste. Increase the quantities according to the amount of servings. Serve the Fritters with the sauce and a green salad.